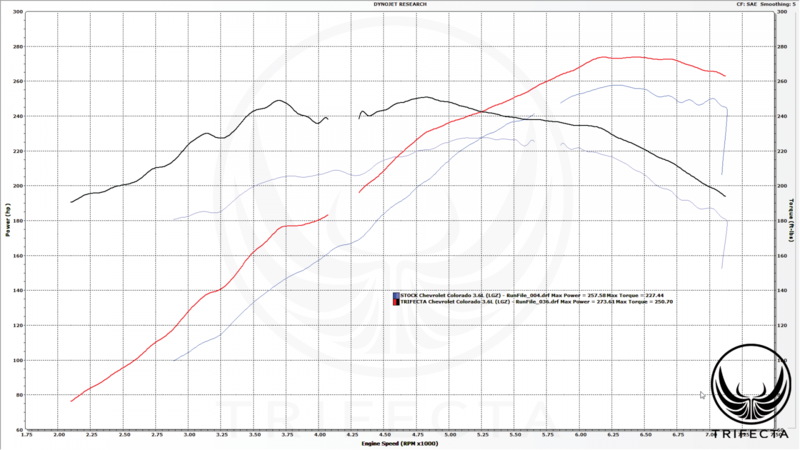 As the established industry leading aftermarket calibration product for the 2015-2016 Chevrolet Colorado and GMC Canyon, TRIFECTA is pleased to announce the immediate availability of the MY2017--2018+ Chevrolet Colorado / GMC Canyon performance calibration product! In about 20 minutes, you can increase the performance, power, sport factor, and economy for your 2017--2018+ Chevrolet Colorado / 2017--2018+ GMC Canyon. While on the outside, the 2017--2018+ trucks look the same (save for a red V6 on the tailgate), underneath the hood, its a totally new truck. Sporting an application-specific 3.6L V6 of the new HFV6 generation (read more about the differences here: TRIFECTA: We love the Colorado/Canyon. We love the 2017 model even more.) and 8 speed automatic transmission, our engineers had to start from scratch in building the successor to the already best-in-class product for the 2015-2016 Chevrolet Colorado / GMC Canyon. 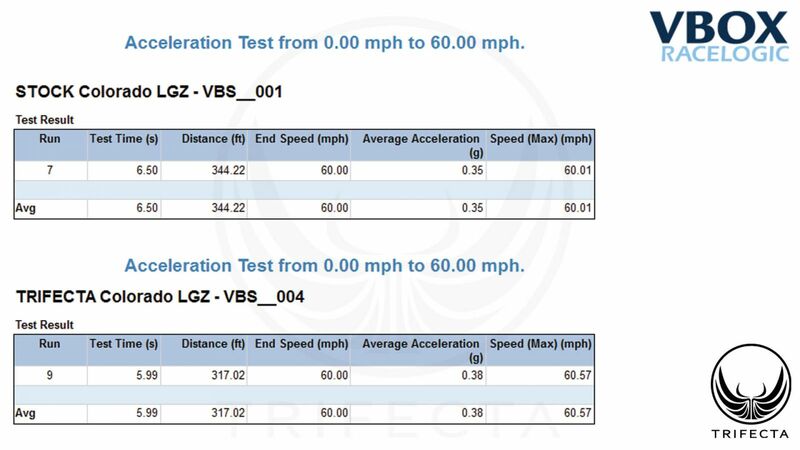 Using professional grade industry-standard telemetry equipment, TRIFECTA has also established proven gains of up to .5 seconds in 0-60MPH acceleration times versus the factory calibration through power gains, throttle ramp rates, and shift schedule optimization. The LGZ-equipped vehicles, along with most other trucks equipped with an 8 speed automatic transmission have a “detent” at the bottom of the accelerator pedal travel. On the factory calibration, the driver must consciously press through this detent in order to achieve maximum acceleration and full downshifting. While in TRIFECTA's SPORT mode, maximum acceleration and full downshifting can be achieved without passing the detent. This allows for a level of throttle modulation during sporty driving maneuvers not possible on the factory calibration. The LGZ equipped vehicles come mated to an 8 speed automatic transmission (8L45). A TRIFECTA exclusive-feature allows recalibration of the transmission's behaviors WITHOUT requiring an expensive, and inconvenient “unlocking” service. Want to start off by saying you get what is advertised, a solid tune that improves the overall driveability and performance of the truck. Being able to change modes on the fly is one of my favorite features. No other vehicle I've tuned supported that option. Eco mode is like a better version of the stock truck tune. Seems to run smoother, and a bit quicker to shift down when needed. Does not stutter/chug up hills while under load nearly as much in the 30 - 40 mph range. Only on rare occasion have I noticed it still do this. Throttle seems to be a bit less sensitive to inputs at highway speeds which is good for mileage. 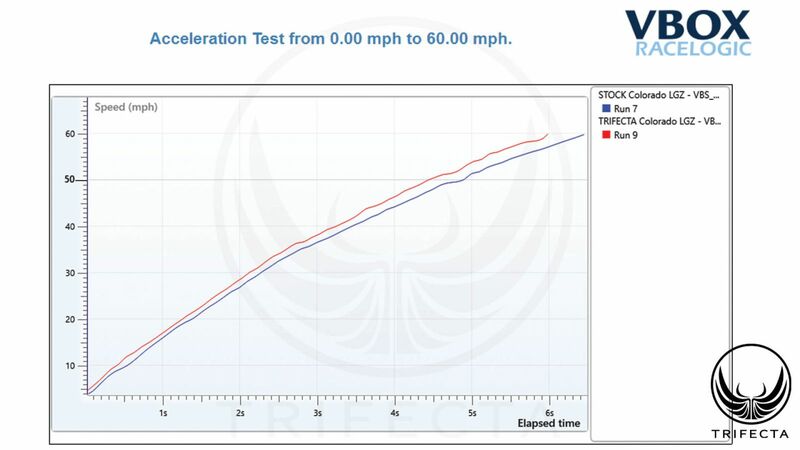 Mileage seems to be on par or slightly better than stock. Averaged 25 mpg in mixed driving conditions over a 455 mile run. This is how the truck should have run straight from the factory. Sport mode is a whole other story. Throttle is noticeably more sensitive / progressive. Great fun, but abrupt inputs yield abrupt results. You need to get a feel for how the throttle is mapped to be smooth, but it's certainly got more pep. The truck holds first and second longer. When merging and passing you have noticeably more grunt, it drops gears and goes. Transmission shifts are very positive, what I consider firm but not harsh. I also opted to disable the AFM in Sport mode. Made sense in Sport mode to have all six cylinders working all the time. In both modes, it seems that the timing and fueling changes smooth things out and add a bit of power and torque. That coupled with the improvement in the transmission logic, the tune really works well. If you ran 91 octane in it, you'd probably see even more performance out of it. It's a truck though, and I just can't justify running premium in it. I feel the tune delivers on its claims, and would recommend it to anyone. I thought it had a good performance envelope for a truck in stock tune. Now, it's even better. Two solid driving modes with the ability to switch on the fly. Eco for daily driving, and Sport for when I want that extra punch. Not really any downside. Have logged 1800 miles on my 18 Z71 since flashing this tune. averaging 18.5-19MPG so far while in sport mode 90% of the time and a mix of city/hwy roughly 60/40. Only other mod is a K&N plenum tube and filter. The truck is a different vehicle in sport mode! Feels much quicker, hold gears longer at partial throttle, and feels like it has a good bit more power. Much more fun to drive. I love my Advantage+ tune on my 2017 Colorado V6. The sport mode is raucous, and the eco mode shifts much closer to stock, but still feels like major gains when driving. I actually spend most of my time in eco mode. I can't say enough good things about the Trifecta, it gives the best of both worlds, so to speak, and the customer service feedback is great as well. I've had it for about a year now, and only recently came across an issue where my truck started running and shifting funny. Originally, I figured the ECU had just relearned some of its old habits, so I re-flashed the tune. It was still off, so I thought maybe we did it wrong (I have to use a friends laptop to upload it). It turns out the tune was probably fine all along, and I believe the problem was just a bad tank of gas or two, because it has sorted itself out on its own. I only mention that so if anyone else runs into something like that, they can start their potential fix by getting some different gas. Thanks again, Trifecta! I just finished installing a Trifecta Advantage plus tune on my 2017 Colorado 3.6 V-6 with the 8 speed automatic transmission. After providing Trifecta with the necessary vehicle ECM module info, the download was flawless . I immediately took my Colorado out for a road test and was very pleased with the change in performance. Accelerating out onto the highway it holds first and second gear a little longer than stock, and under WOT, the shifts are firmer. I was critical of my vehicle's performance at speeds around 40 mph, as when attempting to accelerate, the transmission felt like it was stuck in a higher gear and lugging until you did a forced downshift. With the Trifecta tune, the vehicle is already in a lower gear or depressing the accelerator slightly produces a almost imperceptible downshift. The extra torque the tune produces is also evident at lower speeds when a downshift is not necessary. Engaging "shift on the fly" is accomplished by turning the cruise control on and off. If driving along in Sport mode (cruise control off) and switching to Eco mode (cruise control on), the transmission will immediately shift into a higher more economical gear with a corresponding drop in rpm. I would recommend this Trifecta tune for anyone seeking a performance upgrade to their 2017 Colorado V-6. Stock - I hated the way the truck drove. Tuned - the truck drives like it should have from the factory. Sport is a bunch of fun. Do not wait. Do not hesitate. Fun, makes the truck fun to drive worth the investment.